Dokku provides an environment very similar to Heroku technically, allowing Dokku to take advantage of Heroku buildpacks to deploy your apps. Dokku uses these buildpacks to automatically build Docker containers that can run your apps and services. Refer to the Dokku documentation for more information on Dokku. For this tutorial we’ll be using this Spring Boot example app I’ve set up. It’s a very basic app with a single HTTP endpoint that serves up a semi-random quote retrieved from a Postgres database. It’s a completely vanilla Spring Boot app, except for a single file to instruct Dokku how to start the app but more on that later. Let’s get started! Get a server with root access. Dokku requires at least 1GB of RAM and officially only supports Ubuntu 14.04 x64. For convenience you’ll want to assign a DNS hostname (dokku.example.org) to your servers IP and preferably even assign a wildcard record so you can deploy apps on <app name>.dokku.example.org. SSH into your server and execute the following command to kick off the Dokku installation. Run this either as root or make sure your user account has sudo permissions. Sit back, get some coffee, this will take a couple of minutes. When the command completes open your browser and navigate to the ip address or hostname assigned to your server to complete the Dokku setup. 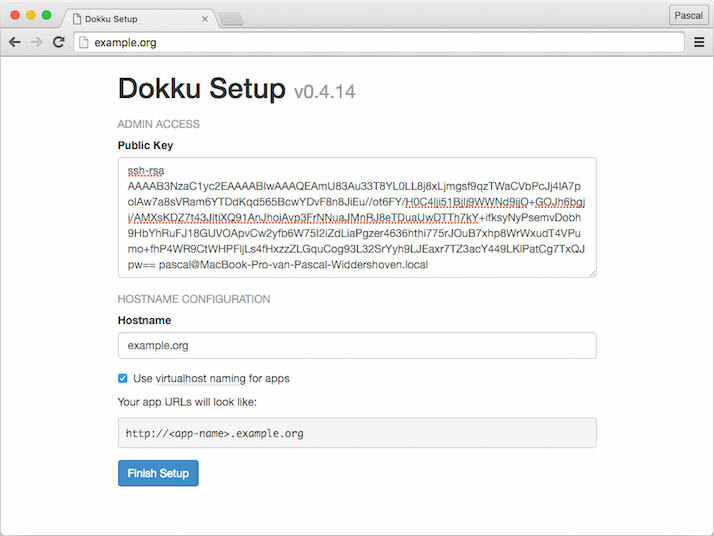 Provide your SSH public key here so you’ll be able to push your app to Dokku later via Git. Enable use virtualhost naming for apps and enter the hostname you assigned to your server in step 1. That’s it, you now have a fully functional Dokku instance up and running! Let’s see what it takes to actually deploy an app. We’re about ready to deploy our first app. In general if you want to deploy an app on Dokku you don’t need to make a lot of modifications to your app. Especially if your app adheres to the Twelve Factor guidelines you should be fine. Most importantly your app should allow configuration via environment variables or command line parameters. Fortunately Spring Boot embraces the Twelve Factor guidelines. Spring Boot supports configuration via environment variables out of the box and it’s trivial to implement your own. 1. I’ve created two property aliases to allow configuration via $PORT and $DATABASE_URL. This is not strictly necessary but I prefer the more generic environment variables over the Spring specific ones. 2. I’ve added a Procfile to instruct Dokku how to start our app. Dokku will read this file during deployment and use the web process to boot our app. You can read more about Procfiles here. During deployment Dokku invokes mvn install on our app so it will build a jar. Here we instruct Dokku that to launch our app it needs to execute the jar. We set the $DATABASE_URL to $JDBC_DATABASE_URLwhich is an environment variable provided by the Java buildpack that formats the database connection string for JDBC compatibility. Alright so now our app is Dokku compatible. Before we can push our app to Dokku we need to configure our application in Dokku. For simplicity enter the following dokku commands in an SSH session on your server. Later you can setup the Dokku CLI client to run these commands directly from your local machine. This will pull in a Postgres Docker image so give it some time to complete. That’s all the configuration we need, let’s actually deploy our app now! Dokku uses a Git push to deploy model, meaning that you push your app sources into Dokku using Git. To deploy you simply add a git remote to your repository pointing to Dokku and git push every time you want to deploy your latest changes. Execute the following command in your shell. Replace dokku.example.org with your actual Dokku hostname. Dokku will now detect our app is a Java app, build a Docker image suitable to run Java apps, compile the app and run it. Open your browser at http://my-app.dokku.example.org/ and see a nice random quote! Dokku takes a bit of one time setup but once you have your Dokku instance ready, deploying new applications will be a breeze. Do note that Dokku was designed for simple single server setups. If you need fancy stuff like clustering, access control etc you might want to look at one of the more comprehensive projects in this space like Flynn, Deis or Cloud Foundry. Even though Dokku is quite simple, we’ve only scratched the surface of what it can do. You now have a fully functional Dokku instance so go ahead and explore the Dokku docs to see what more is possible! If there’s no suitable Heroku buildpack for your app you can always deploy a raw Docker container using Dokku by simply including a Dockerfile in the root of your project. 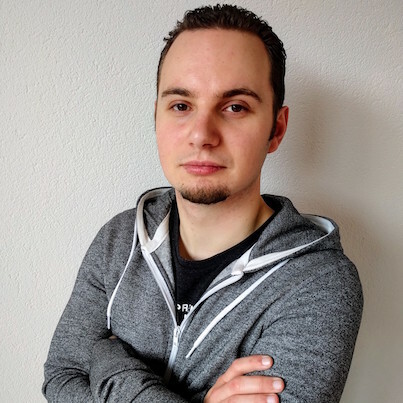 If you’re planning to deploy a more complex Spring Boot app to Dokku you might want to look into Spring Cloud Connectors. Spring Cloud Connectors can automatically detect that you’re running in a cloud platform, and configure your HTTP port and database automatically for you. Spring Cloud Connectors officially don’t support Dokku, but the Heroku support works just fine with Dokku. Also be sure to check out the plugins that Dokku offers to make use of databases, message brokers etc. There’s even a Dokku Let’s Encrypt plugin for dead easy Let’s Encrypt SSL certificates.